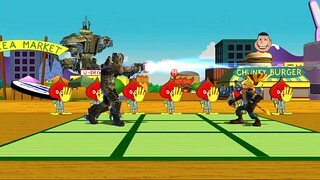 Happy to be back to tell you about some new surprises from PlayStation All-Stars Battle Royale. More costumes? More minions? Well, okay, yes. But also more new characters! Our newest challengers are Isaac Clarke from Electronic Arts’ Dead Space, and Zeus from… well, from some of the foundational myths of Western society, but also from a little PlayStation game you might know called God of War by SCEA Santa Monica Studio. How did these two emerge as All-Stars from the vast PlayStation multiverse? Synchronicity. We were talking with some friends over at EA who were hard at work on Dead Space 3, and with a lot of Dead Space fans on our team and all the cool tools at Isaac’s disposal, some quick concepts emerged and we knew he’d be a great addition. We’ve also wanted to add another “heavy,” hard-hitting character into All-Stars (Big Daddy was getting lonely), and with all the work on God of War: Ascension around Sony Santa Monica, Zeus emerged as a perfect fit. As you might remember, Zeus is kind of an arrogant jerk, but one thing you can say for him is that he does not mess around. As King of the Gods, he’s a big guy, used to getting his way, and he hits HARD. Of course he’s got some cool combos, but his primary offense is centered around fewer, but more powerful strikes that generate a ton of AP and send enemies flying. He can power up virtually all of his attacks into a “charged” version with all kinds of new effects, giving him one of the biggest move lists in the game. 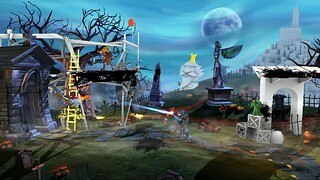 Super-armored rushing punches, a clone move, teleports, and lightning bolts–lots and lots of lightning bolts. Your best bet against Zeus is to stay on his good side (aka behind him), or far away. His level 1 is a giant Lightning Clap that lacks range but has a great area of effect. Level 2 lets Zeus take to the skies and fly anywhere before exploding in a deadly lightning storm. His level 3 “Wrath of Zeus” takes you to Olympus to fight a godlike 100-foot tall Zeus, and in true boss-fight form, he can wipe out half the screen with a single strike. 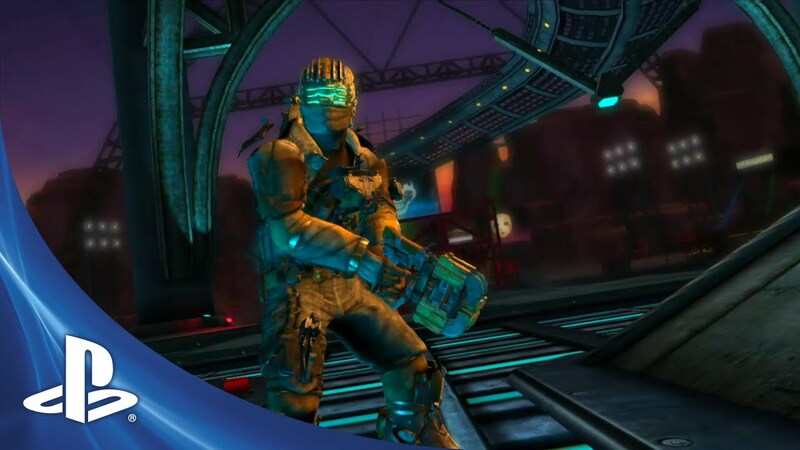 Through a combination of playtesting and staying true to his original series, Isaac emerged over the course of development as a strong mid-range fighter using the unique weapons and Kinesis/Stasis abilities you’ll recognize from the Dead Space series (think somewhere between Drake and Jak, with a lot of twists). He has some very interesting long-range options (the Bouncing Bola acts like sniper rifle that bounces off of walls, getting more powerful with each bounce) and he’s got some great moves up close, but just as in Dead Space, he’s at his best keeping foes safely out of his face. He can advance or retreat while firing his trusty Plasma Cutter, toss proximity mines, use Stasis attacks to freeze opponents, or spin slowly moving Ripper blades at enemies with a blast of Kinesis torque. His level 1 super fires a supercharged stasis burst and then overloads his Plasma Cutter, which can be aimed anywhere, even at very long range. His level 2 super overloads his Kinesis module creating a bubble that launches nearby enemies away at “terminal” velocity, and Isaac’s level 3 takes you into space where he blows the airlock, sucking everyone into space for a quick game of something like “Asteroids” where Isaac flies around blasting opponents and space debris into dust. Finally, what better to welcome new characters than with a new stage? The new “Graveyard” level mashes up MediEvil‘s Graveyard opening with… The Unfinished Swan. While we start in recognizable MediEvil territory (complete with pop-up zombies and a wisecracking gargoyle), the “Swan” elements are shown off with a mid-match whiteout and ink splatters that slowly reveal the emerging structures. There are lots of little Swan touches throughout the stage, from the hidden labyrinth, to a balloon, the King, and of course the Unfinished Swan itself makes a cameo. So how do All-Stars fans get their hands on the new stuff? The new DLC pack hits the PlayStation Store on March 19th. As before with the recently released “Fearless” stage, the new “Graveyard” stage will be free in online ranked matches and $1.99 if you want to own it. As for Zeus and Isaac, I’m very happy to announce they will come to North America FREE as a redeemable downloadable voucher code packed in with the new God of War: Ascension, which launches on March 12th. When Zeus and Isaac Clarke go live in All-Stars on March 19th (one week later), you can use your code to redeem them any time after they are live. For anybody who doesn’t pick up God of War: Ascension (but of course that’s only crazy people–it’s got what I think is the most epic final battle in the series’ history), the characters will also be for sale in the PSN Store for $4.99 each. I’ll have some more details coming on the new challengers in the coming weeks — until then, see you online! Hmm. Not picking up GoW Ascension, but I might pick these guys up… I enjoyed playing with Emmit and Kat. Love the Unfinished Swan stage. will this be the same in the uk when i buy god of war ascension? Although i’m not really a fan, I hope Crash bandicoot and Spyro get released as characters, Both of them helped Sony get where they are right now and are probably the top 2 requested characters people have been asking for, also Gex could be pretty cool too. 1. You said the game could fixed live and wouldn’t need big patches. That’s 1 lie. 2. You said only 1 character from each franchise would be represented besides Cole. That’s 2 lies. 3. You said this game was more than a marketing ploy and about Playstation. Probably your biggest lie to date. Now let’s talk about how you destroyed your game with glitches that have been plaguing the community for weeks. 2. Kat and Emmett cause the matches to lag very badly. Nice one on this. Can’t believe this DLC got through quality testing. 3. Character switching in ranked and quick matches. This has been here since day 1 launch. Get your act together. Now I’m just gonna list reasons why you guys pissed me off. I paid a full $60 for this game on day 1 and you guys dropped it to $40 in less than a month. Thank you so much. The Vita file size is almost at 2.5 GB. It started at about 1GB. That’s because each patch you releases increases the file size. Optimize the file size for christs sake. I like the character editions, but free only if you buy a certain game sort of pisses me off. I was in huge support of all this until I read that… Not a fan of God of War games themselves so I won’t be picking up Ascension, and this annoys me. Not the content I wanted to see by a longshot, but it’s nice to see you’re releasing content. I know it’s your franchise, but I really think you’re leaning too much on God Of War, with it having the most items and characters, and I hope you branch out some in the future. You guys need to quit giving me free characters. How are you gonna generate the revenue to release all the awesome characters I want if I’m only giving you 2 bucks a pop for levels? Really psyched for Isaac! He was really high on my wish list. Love the Unfinished Swan incorporation too; it was one of my favorite releases of 2012. Looking forward to God of War, these characters, and hopefully many, many more. Crash, Spyro, Cloud, Snake, Lara Croft, Tomba, uhh… hang on. Let me get my PSone games out of my drawer. *one minute later*. Uhh… let me check my brother’s PSone drawers and boxes. *30 minutes later*. So I can’t think of any more characters, but how about a Tekken stage? Maybe that mixed with Fat Princess? This game is great but it needs to focus on the PSone more. Stop basing stages on PSN games and go back to those polygons we love so much! As long as the DLC keeps coming until we have nearly 40 character or over 40 characters I don’t care, but seriously find a reason to a nostalgic character like Crash, Spyro, an older FF character, Solid Snake or Big Boss. There are new games to promote with these characters in them such as a probably new Skylanders, a new MGS with Big Boss, a FF10 remake(a good place to steal Auron, Yuna, Seymour, or some other cool characters from). Even though she’s new and widely hated upon Lightning from FF13 would make a solid addition if nothing else and Lightning Returns is this year. For levels Dream Weaver from Spyro fused with the Meadow from MGS3 you ght the The Boss in. Zanarkand fused with hell if I know. You get where I going. Lots of franchise you have fully exploited or at all. If Isaac came from Ea than it wouldnt be too far fetched if they added Shepard from Me..the problem would be figuring out which shepard to use between male, female and the customization feature..If they were able to pull that off itd be awesome…. What about those of us who only own a Vita and thus can’t play GoW:Ascension even if we wanted to? Instead we have to fork over $10 if we want both of these characters? Should be free the first two weeks like Kat and Emmett, or at least for PS+ subscribers. I definitely will not be paying for it. Zeus is a lame addition and not much of a fan of Dead Space. We need Crash and Spyro. How about Rau from Mark of Kri, and Jen from Primal, those would be awesome new characters! And from Playstation first party games (if i remember correctly)! @38 Um, a game had multiple characters already in PS All-Stars, namely Infamous with two Coles, even if they’re pretty much the same. Zeus is a cool character, I’m pretty fine with this whole thing. Not sure how I feel about the choice of characters, but seeing DLC in general is great. But… where are Raiden, Dante, Big Daddy and Heihachi’s alts? LOL. PlayStation All-Stars Battle Royale is the most racist game in the history of fighting games. Why do you keep adding more male characters? There are like 21 male characters and ONLY 3 female characters (actually ONLY 2 before the DLC). – The girls of Hyperdimension Neptunia (Especially Noire, because she represents the PlayStation 3 console itself). – Milla Maxwell (Tales of Xillia). – Lara Croft (Tomb Raider). – Lightning and Fang (Final Fantasy XIII). – A lot of awesome Final Fantasy girls (Tifa, Yuna, Yuffie, …etc). – Aya Brea (The 3rd Birthday). – A lot of awesome Resident Evil girls (Jill Valentine, Claire Redfield, Ada Wong,….etc). – Bayonetta and Jeanne (Bayonetta). – Catherine and Katherine (Catherine). – Female characters in the Tales series. – Elena and Chloe (Uncharted). The more the merrier, but yes, people are right when they say that these characters don’t scream “Playstation” to them. But, let’s focus on the new DLC, in my opinion, Zeus is a great add to the roster, not only because of his attacks but because I really wanted to see more antagonists in the game. IsaacClarke is one of the last characters I thought that would be on the roster and that’s awesome, his attacks are great and add something different to the roster. He is certainly an unexpected character. 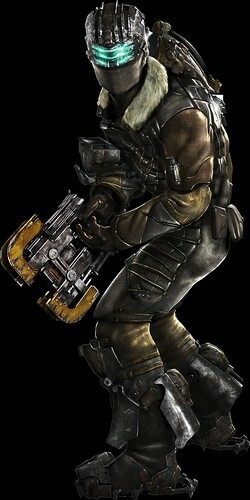 BUT, SuperBot, Santa Monica or whoever is developing the game, now that I see that you guys were able to bring a REALLY unexpected character such as Isaac Clarke, I can see that bringing a character like Crash wouldn’t be that hard. Since Dead Space was supposed to be only for X360. So, seeing that, you guys will have more job and fans will really ask you even MORE characters that Sony owns and/or already owned. And, I’m not gonna lie, I will purchase every new character, but I will still ask you guys for more, put my Most Wanted list on every PS All-Stars news, etc. Thank you SuperBot for this amazing game. Awww Maaan! I was hoping for the “Two weeks free” limited time like what we had with Emmett and Kat. After Kat, Emmett and Fearless, I wasn’t expecting any more character and stage DLC, so this came as a pleasant surprise. Both characters look really fun to play, and I’m glad to see the new kinds of supers (especially the level 3s). Isaac Clarke in particular is personally really cool to see as an addition in this game. I’m a big fan of Dead Space and DS: Extraction! My one issue though is that he is wearing his Dead Space 3 rig. So hopefully his alternate costumes will be the DS1 rig and DS2 rig. Nonetheless, thanks for the great news Seth! Ah, so this is what Seth was hinting on twitter yesterday. Looks decent. Darn shame PSASBR didn’t go on sale with the Gamers’ Choice Awards. Would have loved to jump in on it today. And now the list again lol. Of course that it can be other characters of the same game like in FFVII. And like Santa Monica did now with Zeus. Please add Um Jammer Lammy and Rayman! LOL at Seth Killian only replying to sweetie pie comments, you also have to adress the harder comments, maybe comment on why certain character was and will be implausible, you know if you say crash won’t be in the game, many people will stop asking and stop some of the most agressive comments, be smarter. I try to reply to questions we haven’t responded to before or where I have new information. We love Crash and he was a great part of PlayStation history, but has been said many times, unfortunately including him isn’t solely up to Sony and SuperBot. You actually think all females belong to a single race? What you’re arguing against is sexism, and I doubt anyone will take you seriously when you can’t even articulate the root of your argument like sane, literate person. Only thing here that makes me happy is to see more Medievil support/references. 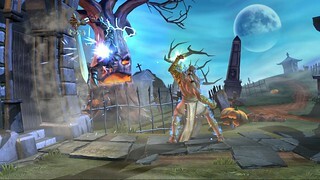 If only they’d make another Medievil based on the original, not that childish PSP remake. Can you tell us what happened with Abe? Apparently he was in development but he was cancelled for some reason. The developers wanted him in and the fans wanted him in as well. He would have been a great character to represent the PS1 era but no you decided to cancel him and add Zeus who was barely requested. If you needed another heavy hitter you should of just picked Pyramid Head. Abe could of been a great addition. Hey Seth! Loved your videos on IGN. If YOU got to pick one first party characters (who isn’t in the game) and one third party characters (who isn’t in the game) to be in PSASBR, who would you pick? And why? Thanks Seth, will be picking these up on the 19th. Cheers. didnt think the cast could get any worse but here i am in complete awe. huge regret buying this game. The sad thing is. Even if Sony put Crash , Cloud , Spyro and Old Snake in the game tomorrow. It is not like a mad rush of people here is going to rush to the store and buy the game. The people here will still complain about something. The truth is PS3 owners are not buying PS3 exclusive games. Look at Ni No Kuni , and Sly Cooper 4 . Both great games and they were barely in the top ten in sales. It is pretty clear that it is a legal reason why Crash and Spyro are not in the game. I am sure they are trying their best to get them in the game. It is not like they are owned by Sony. Was wondering if you could answer this question Seth. Do you need to pre order GOW to get the code? Or could I pick up the game a couple days late and still get it? Zeus ? Really how come there is zero to non refference to Heavy Rain ? It was one of the best selling Playstation games ever!. Wow, Zeus is a great character! So incredible, so iconic, full of personality, the true Sony mascot! I own every Zeus games since PS1, my favorite franchise. So happy here. YOU GUYS GOTTA BE KIDDING ME! THAT’S WHY THIS GAME F-A-I-L-E-D, IT’S A JOKE! IT SHOULD ME CALLED “NON PLAYSTATION ALL STARS BATTLE ROYALE”, OR “MARKETING ALL STARS BATTLE ROYALE”! THERE ARE CHARACTERS MORE MORE IMPORTANT FOR PLAYSTATION, LIKE GABE LOGAN, SNAKE, SPYRO, QUIMERA…. BUT NO, SONY WANTAS Z-E-U-S TO JOIN THE ROSTER!! I WANT THIS GAME TO CONTINUE TO F-A-I-L BADLY, SO BALDY, IT DESERVES! YEAH I’M SCREAMING OF ANGER! I SWEAR IF I WERE CLOSE TO SONY HEADQUARTERS, I’D THROW A GRENADE AT YOU, ‘CAUSE I’M FURIOUS! I WON’T BUY THIS GAME UNTIL I SEE TRUE PLAYSTATION STARS(LIKE GABE LOGAN) IN THE ROSTER! Hi Mr Killian, I’ll admit, I was disappointed at first with the DLC, till I say em in action! I was wondering, since we got Zeus, can we ALSO get Calypso from Twisted Metal? He would be super unique and awesome to play with! http://community.us.playstation.com/t5/PlayStation-All-Stars-Battle/Calypso-Twisted-Metal-Moveset/m-p/39666719 here is a moveset I made for him just in case you guys were to have trouble with 1, tell me what you think? @95 you are an idiot. some of that list is correct but kat, nariko, raiden and toro all completely deserve to be in the game and are some of the best available characters which to be honest isn’t saying much. get a 1 month trial to plus, play gravity rush and revise your list. I have to say that I am disappointed in all the negative comments about the DLC. You guys (Superbot, Sony, etc) are doing some remarkable work getting all these different IP’s together under one roof. I haven’t seen that done to this extent before and I think everyone who calls themselves a PlayStation fan should be impressed and more importantly, thankful. Even though some of these characters aren’t Sony made, I’ve played them on Sony consoles, my console of choice. So they are every bit a PlayStation All-Star to me. My only gripe that I would love to see fixed is the presentation and menus. Spruce up the menu and loading screens, it is far too bland and is the only negative thing I can find to say about this beautiful game. I’d like to suggest adding character history info to the loading screen. Like year they were introduced, the game they first appeared in, screenshots etc. Maybe get concept artwork from the creators and show how they’ve visually progressed over the years. Thank you guys for the continued support!! I actually just bought the costume super pack at full price just to support what you all are doing. I’ll be grabbing the minion pack soon and most certainly this new DLC. Even though I am a PlayStation faithful and fighting game fan, I was a bit hesitant on trying this title. Now that I have, I am so glad I did. This game is simply fantastic. Every character plays like they do in their own native games and that blows me away. I get my PlayStation fanboy fix as well as a genuinely great fighter. ^ @ Raging caps locks. Umm Kat has garnered a pretty huge fanbase after the release of her game. Toro is popular in Japan, not so much in America, and has been representing Playstation since the original console. Radec represents the Killzone franchise which of course is popular. Great to know YOU know what a true All-Star is, you make it seem so easy to gain characters, and instantly show disgust if it isn’t a character you wanted, it’s fine if you don’t like them but to go this far as to say these characters aren’t “All-Stars?” is insane because now, after being a part of this game. They’ve become All-Stars in their own right. The only point I can come to an agreement with is Gabe Logan being included, that would be awesome.